She’s just 25, but she’s already running an award-winning social enterprise, FoodCloud, responsible for the distribution of more than three million meals to charity across Ireland and the UK. 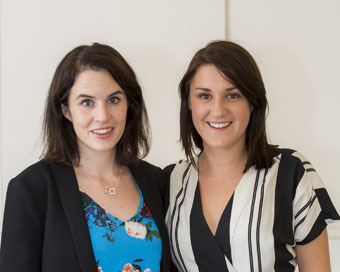 Iseult Ward and her business partner Aoibheann O’Brien can now add the Newstalk WMB Social Entrepreneur Award 2016 to their list of accolades. Iseult recalls how in 2013 she and Aoibheann arranged for a large grocery store in Dublin to have four crates of food close to its sell-by date, collected by the Whitefriar Community Centre in Cuffe Street for charitable purposes. Three years later their company FoodCloud is a rapidly growing social enterprise that, through a technology platform, connects businesses with surplus food to local charities that need it. At the last count, FoodCloud facilitated the redistribution of 1,481 tonnes of food, or the equivalent of more than 3.2 million meals. Iseult is CEO of FoodCloud, which currently works with more than 500 Tesco and Aldi stores and some 1,100 charities across Ireland and the UK. Aoibheann is CEO of FoodCloud’s strategic partner, BiaFood Initiative – the two organisations work together from a shared office and depot in Dublin. Not bad for a pair of twenty-somethings who started out with little more than a university degree each and a mutual determination to do something about the mountain of food being wasted in this country every year. Iseult was just 22 and studying Business and Economics in Trinity when she bumped into Aoibheann, then a post-graduate student doing a Master’s Degree in Environmental Science. It was a partnership made in business heaven – and it has resulted in a hugely successful social enterprise network, which already stretches across Ireland and the UK and, it’s planned, will eventually expand across the USA and into the developing world. In Ireland alone, we waste a million of tonnes of food annually and yet one in eight people in this country are suffering from food poverty. Although the duo started work on the concept while still in college, it wasn’t until after they left university that FoodCloud was established, in October 2013. Initially they carried out extensive research on how to redistribute food that was about to go to waste, eventually reaching out to an organisation in Chicago, which was developing a technology platform – that first platform was made available to the young women for free. “We learned a lot about the best solutions for communities and then we took that research to develop a platform more relevant to Ireland. It enabled us to upscale to a lot of stores nationally. We have a software platform that enables retailers and charities to coordinate surplus food donations within communities.” Take the example of a store such as Tesco in a rural town such as Tipperary, explains Iseult: “At the end of the day such a shop will often have good, unsold food that is approaching its expiry date. Our platform enables Tesco staff to notify a local charity, such as St Vincent de Paul, that food is available, and a time to collect it.” If the charity is in a position to collect and distribute the food, a collection is organised. “It has been great to see the venture grow,” says Iseult. The duo’s efforts gained recognition in June when they won a €24,000 prize, a Virgin Media Business broadband package, mentoring and brand support in the finals of the Virgin Media Business VOOM 2016 Competition. The increased capacity of the system is down to BiaFood’s successful warehouse model. The organisation operates three large warehouses in Cork, Dublin and Galway, which store large quantities of food for redistribution to the charity sector. “It’s the warehouse model that allows us to take the larger quantities of food – and that’s where Biafood comes in,” says Iseult. Food donors are charged a fee for the use of the software platform and the proceeds are used to fund the organisations’ operating costs. Working to full capacity, between them FoodCloud and BiaFood Initiative are capable of redistributing some 4,000 tonnes of food a year: “Our aim is for Ireland to become a leader in developing solutions for surplus food redistribution from an ever-growing network of sources. We have developed an online platform that is capable of redistributing food from hundreds of retail outlets – now we also have a solution for the rest of the food supply chain – manufacturers and distributors and hopefully farmers,” Iseult explains, adding that the two organisations plan to come together in a re-brand in the near future. This interview was originally published in July 2016 and has been updated to include FoodCloud’s award win.